budgeting • What Would You Do? 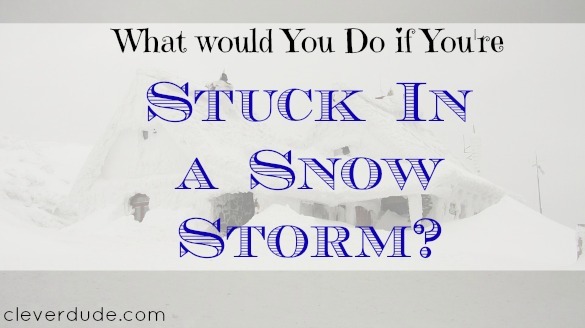 Stuck In a Snow Storm – What Would You Do? Five inches of fresh snow, followed by wind gusts up to 50mph meant we weren’t going anywhere. Together with the other families we were on a midwinter vacation with, we shelled out the money for another night’s stay at the hotel. Cut our vacation a day short and leave on Saturday before the storm arrived. We inquired the refund policy at the front desk and found that we would not be refunded any part of our prepaid cost if we left early. We would be out $175 a family, plus a full day of our vacation at the indoor water parks. Stay an extra day until after the storm had passed. This would cost $125 per family (Sunday nights are less expensive), but we would get an extra day of vacation and fun with our friends. It wouldn’t cost us anything additional in food, because we were staying in rooms with full a full kitchen and between the four families we brought enough food for a week. I was honestly hoping that the weather forecast would be wrong, as they frequently are, and that we’d be on our merry way Sunday morning. Unfortunately the storm unfolded exactly as predicted and we found ourselves staying the extra night. There were some complications as we had to all had to call our employers informing them that we would be missing from work on Monday. While bosses were generally understanding, burning an unexpected vacation day in January is not usually desirable. We spent the extra day doing the same things we had been doing the previous days of our vacation: flying down water slides on inner tubes, relaxing on lazy rivers, and bobbing up and down in the wave pool while the wind howled outside. Reconciling the checkbook later that night, I winced just a little as I subtracted the extra hotel fee from the balance, not sure if staying the extra day was the right decision. 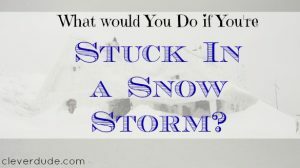 What would you have done, gone home early and just eaten the hotel fee for the night lost, or paid for an extra night to wait out the storm? Sounds like quite the storm. I think you did the right thing. While having that unexpected vacation day isn’t ideal, leaving in the middle of a huge storm wouldn’t have been ideal either! We would have likely done the same thing you did. An extra day of vacation for a bit more cost. Not ideal, but at least it was a fun day, right? I would have done the same thing. For me, it’s about value. Either $175 for nothing, or $125 for something. Of course it would be slightly different if you didn’t have an extra vacation day, or couldn’t take it for whatever reason. I would have done the same thing, too! I’m with the other commenters. You did the right thing. @daisy – We definitely wouldn’t have left in the middle of the storm…but we could have left before the storm hit (but not be refunded for one of the nights we had already paid for). We did have a great time though – thanks for stopping by! @Peter – it was an AWESOME time! The place we stayed had some really fun water slides for kids of all ages. 🙂 Thanks for reading! @Cathie – we absolutely got value out of the extra day! I have a very flexible employer such that it wasn’t a big deal that I took a vacation day on short notice on Monday – so that made the decision pretty easy for me! @suburbanfinance – yeah, now that it’s over and we’re home, it certainly feels like we made the right choice. Especially now that I’ve had 1/2 a day to get through all my work emails and am caught up again. Thanks for your comment! @Bryce – Sounds like the “Ayes” have it! lol. I haven’t been trapped in snow for a while but I recently got stuck at a border crossing in the middle of nowhere. I had the option of freezing all night on the bus or staying in the only (expensive) hotel in sight. By the time it got to 3 in the morning I packed away my blankets and headed to a bed in the hotel. It was an expensive decision but well worth it. @Robert – I can’t believe you made it to 3 in the morning! Being not frozen definitely outplays money any day..lol. thanks for stopping by!